Yes, Finally!!!.... what every 66 and 67 Chevelle SS owner has been waiting for, The FACT BOOK!!! The Guide to Restoring your 66 and 67 Chevelle SS the CORRECT WAY......is done! Fifteen years of intensive hands on research with input from some of the most knowledgeable Chevelle Enthusiasts in the country, a reference guide has been produced unlike anything out there for 1966 and 1967 Chevelle SS. 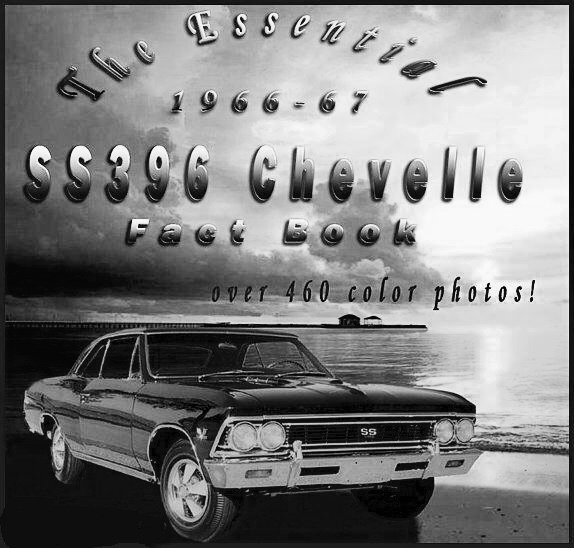 Nowhere else can you find the vast amount of details and FACTS about the 66 and 67 Chevelle SS all in one guide. If you are interested in buying this guide, know that it is actually a CD ROM "only".....NOT A PAPER FORMAT BOOK. Please make note that the information on the CD is printable for private personal use only and when done with a laser jet printer, it produces a nice "paper book" version of the CD. The CD has 58 chapters, 19 appendices and 460 color photos and deals with just about every aspect of these two model years. The cost of re-doing the mistakes you will likely make without this information makes the FACT BOOK CD the best money you will spend in the early stages of your cars' restoration. It is not a rehash of the many so called and outdated "Restoration Guides" out there. Nor is it the FINAL WORD on 66 and 67 SS; I am always willing to learn new FACTS! But it does answer or address tons of questions and details never before seen in one book. 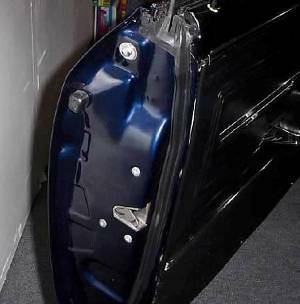 Most of the restoration guides out there are old and outdated, and cover 64-72 Chevelle. Those guides are generally Fluff at best, with one chapter, if you are lucky, for 66 and 67 SS. This guide covers the DETAILS, the stuff National Show winners are made of. Quite frankly, I can't think of many questions which won't be answered or addressed in this book. 58 chapters dealing with everything from casting numbers, trim tags, glass decoding, wheels and tires, original build sheets and documentation, engine detailing, etc, etc! My response to those who have asked is always the same..."It's in there!" If you are looking to restore your car to factory specs. or just want to make your car the best you can ....you will need this guide! Don't hesitate! There are a ton of restoration details under the hood of 66/67 SS Chevelles. 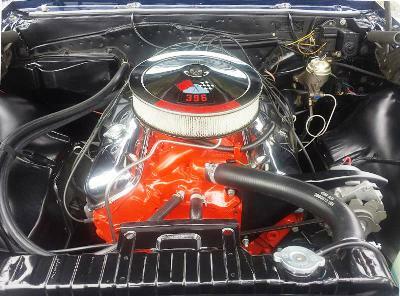 One Detail Fact of note as shown on this correct 66 SS 396/360hp engine bay is the HEATER HOSES. 66's Did Not Receive any GM Makings on the Hoses, unlike that of a 67. As shown here, the hoses are ribbed but no white GM Markings as are so often seen on restored cars. ALL 66/67 Chevelles., Restored or Unrestored should have all set screws, locking mechanism, etc UNPAINTED as shown here. Hello Mike, I received my Fact Book CD today and this evening I have been reviewing its contents. And might I add, I am enjoying what I'm finding. Very well done sir. This information will greatly help and save me time in this restoration. I received My Chevelle CD today. I just want to let you know I am very pleased with my purchase. It is everything I was hoping it would be. I don't think you left anything out. Thanks for sharing your vast knowledge of the 66/67 Chevelle. I do believe all this information will help me with finalizing the restoration of my 67 Chevelle SS. Hello my name is Howard and I purchased a fact CD from you last year and I have to say that is the most comprehensive data source I have ever seen put together on Chevelles. You really know a lot! (and thanks to you, I know a bit more now too). Hi Mike, I received your 66-67 Chevelle CD yesterday. Very well done! Brings back a lot of good memories of my Chevelle days. I just received the disc you sent me and out of many things I have purchased, this is such a wealth of information. It is a awesome product and I am very pleased with it. Hello Mike, How are you doing? Finally had time to look at the Fact Book. Excellent details,very nice. Keep me posted on a 66/67 for sale. HI, JOHN , I HAVE PURCHASED YOUR CD, THE MOST INFORMATION IN ONE LOCATION I HAVE EVER PURCHASED , GREAT JOB. YOUR CD HAS HELPED SO MUCH. THANK YOU. "Mike, just wanted to tell ya, I love this CD. It is answering so many questions that I have been thinking about. Thank you very much for taking the time to make such a CD and its done very professionally. I love it." Thanks again. Great Fact CD, I couldn't have finished my 66 without it, and I seriously believe that without you that the 66-67 chevelles out there would not even be close to being the most detailed chevelles out there. on the 1966 Chevelle as you are attlready. Thanks a million for your efforts in putting together all this information....A happier (and smarter) 1966 SS396 Chevelle Owner! The Above Facts and Many more are found throughout the Fact Guide. ORDER YOUR COPY NOW! SHIPPING IS FREE BY US FIRST CLASS MAIL DIRECT FROM MY HOUSE, NO WAITING FOR OUTSIDE VENDORS!